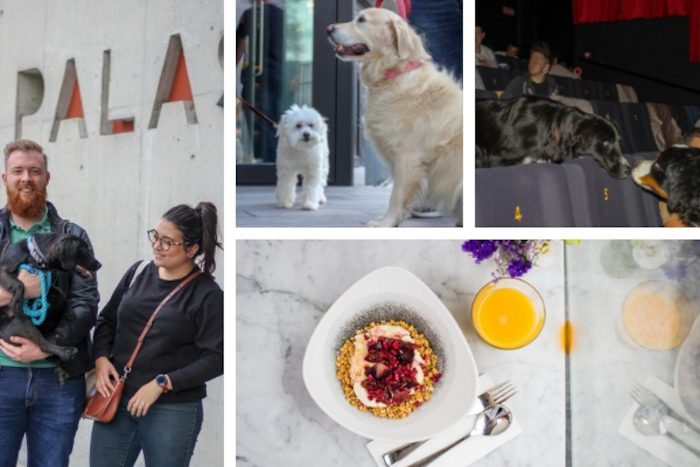 Galway’s newest destination restaurant, set on the ground floor of the Pálás cinema Merrow is bringing dog lovers dreams to life. On Saturday 8th December, from 10am Merrow will host a brunch that allows your four-legged pal to come to brunch. The brunch will be hosted in aid of Madra Dog Rescue the charity which is dedicated to finding new homes for unwanted, neglected, abused and abandoned dogs. The brunch will take place in the dog friendly Bar of the Pálás cinema and of course Merrow Chef Liga Jarovoja has devised a dog friendly menu too. There are two sittings for you to choose from 10am & 11.30am. Human tickets are €20 (and dogs go free ). People can enjoy the Two Legs Brunch featuring Beetroot PAWCAKES with smashed peas and eggs, Buttermilk chicken WOOFLES with scrambled egg, an oat GRRR….NOLA or Merrow favourite Kelly’s black pudding with poached eggs and homemade relish. For the dogs, it’s a Bone marrow and vegetable risotto or a Granola BARK! Merrow at Pálás cinema is open from 10am to 9pm Monday to Thursday and to 10pm on Friday, 10am to 10pm at weekends for breakfast, lunch and dinner. The seasonally shifting menus at Merrow bring together produce from Galway and beyond as well as making the most of foraged ingredients from the wilderness of the nearby coast and countryside. Merrow is an advocate of clean eating and zero waste, the cooking is deceptively simple yet accomplished, innovating classic dishes while creatively showcasing the finest ingredients with subtle nods to the food of eastern and central Europe. More time at weekends means the focus shifts to an unhurried brunch available from 10am to 5pm with the likes of Kelly’s Black Pudding, poached eggs, spuds and relish and beetroot Bloody Marys - the perfect start to an indulgent afternoon catching up with the latest releases. Tickets, €20 .To book the Gone to the Dogs brunch call 091 394 076 or book online at https://www.eventbrite.ie/e/bring-your-dog-to-brunch-in-aid-of-madra-dog-rescue-tickets.